Netbook or notebook? Between the One Laptop Per Child (OLPC) project (see previous post), and products like the ASUS Eee PC, there's a new kind of Internet device in town -- the "netbook" -- a highly portable wireless-connected small form factor notebook. Netbooks are intended to be easy to carry almost anywhere, and therefore are reduced in size to around 2 to 3 pounds, with 7 to 10 inch displays and scrunched keyboards. Netbooks are focused on online access, browsing websites and keeping in touch with e-mail, but run versions of Linux or Windows so you can also edit documents and the like, albeit a bit sluggishly with low-power processors like the Intel Atom. But notebooks can be ultraportable too, with products like the Apple MacBook Air and Sony VAIO TZ series weighing around 3 pounds, but offering larger displays and/or more processor and storage, and at premium prices ($1800 and up). However, while Sony has experimented with very lightweight systems like the VAIO X505 from 2004 at only 1.84 pounds, its VAIO line from last summer was more focused on bigger systems, with larger displays, enhanced performance, and even Blu-ray disc drives (see previous post). Then last month at CES came the introduction of the Sony VAIO P series Lifestyle PC -- with 8 inch display, but weighing only 1.5 pounds, and measuring 4.72 x 9.65 x 0.78 inches. Sony describes it as the length of business envelope and as thick as a cell phone, so you can slip it into a jacket pocket or a handbag. 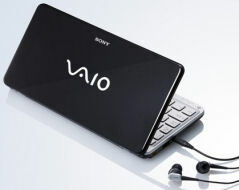 To go online, the VAIO P includes both Wi-Fi and mobile broadband (with cellular subscription). And it has a built-in webcam and microphone for Internet calls, plus GPS tracking. It's powered by a 1.33 GHz Intel processor, with 2 GB of internal memory and up to a 60 GB hard drive or 128 GB solid state drive (SSD). Interestingly, the VAIO P runs Windows Vista (Home Premium or Home Basic), so you can run your standard desktop applications, although visibly slower. It also has an Instant-mode option to rapidly boot up into the Sony Xross Media Bar interface to access your music, video, photos, plus the Web. Sony quotes a 4 hour battery life with the included standard capacity battery, or 8 hours with the optional large capacity battery. Yet the VIOP P avoids the premium pricing of the ultraportable notebooks -- it's $899 with a 60 GB HDD, $1199 with a 64 GB SSD, and $1499 with 128 GB SSD. It should be available this month, in snazzy colors (garnet red, emerald green, onyx black, crystal white, classic black). Just don't call the VIOP P a notebook -- Sony is carefully avoiding the term. Instead, the Sony reps describe it as a second system to compliment your existing notebook, since you can more easily bring it along with you and use it to stay in touch. In this way, netbooks are positioned more as competition for smartphones, which do not have the larger screen and near-full-size keyboard for extended usage. But you can't really clip a netbook on your belt or slip it into your pocket, so this indeed becomes a lifestyle choice to go netbook, or not. See Wikipedia on netbooks and product comparisons. See my Portable Communications Gallery for information on netbooks and smartphones. This entry posted on February 3, 2009. Next: Solar Chargers - Solio and HYmini.